"First Class Experience! Biking Hiking Kayaking the San Juan Islands"
"Kayaking and biking with Crystal Seas Kayaking"
"TerraTrek Biking, Kayaking, Hiking and Camping Trip"
"TerraTrek Cycling Multi Day Tour"
Bicycle, Hike, Sea Kayak In The San Juan Islands . . . With TerraTrek. Spend your days cycling along quiet winding roads that lead to views of the sea. Enjoy tastings at a local vineyard and explore an organic lavender farm. Hike along grassy rolling hills or through forests that lead down to a waterfall. Feast on cuisine made with local organic ingredients including dinners at the most exquisite restaurants. 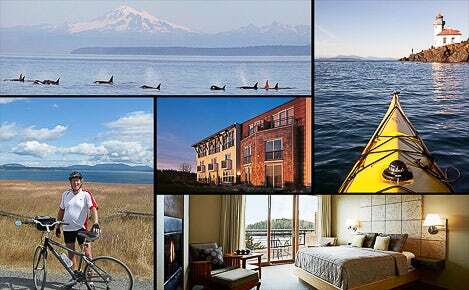 End each day indulging in comfort at the highest rated luxury inns in the San Juan Islands on our 2-6 day Inn to Inn Cycling Tours. Wake up to the sound of waves lapping on a lake. Enjoy regional wine and delicious campsite meals made with ingredients from local organic farms. 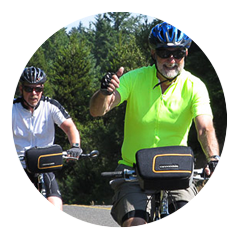 Cycle until your heart's content along forested two-lane roads that lead to coastal views and historic lighthouses. Hike a path around a lake and cool off in a waterfall. End each day savoring beautiful sunsets and a sky full of stars. Fall asleep below giant old growth cedar trees on our 2-6 day Camp to Camp Cycling Tours. Create memories of a lifetime with your family. Cycle safe, two-lane roads that lead to beaches. Hike forested trails that wind up to island peaks. Cool off in a mountain lake or waterfall. Walk through fragrant fields of lavender. Check out abundant wildlife. Reconnect with your family over delicious meals made with locally farmed ingredients. 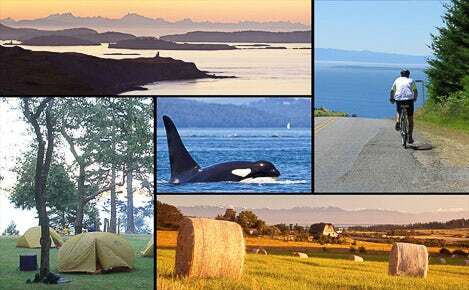 End each day relaxing at top rated luxury inns on our San Juan Islands 2-6 day Family Cycling Tours. "Our guides were the highlights of our trip. They were great...supportive, knowledgeable, helpful encouraging, good conversationalists...perfect in every way. They are treasures." "Our days were planned great with enough free time, good start times and terrific biking.."
"I can't thank you enough for making our vacation so fantastic! Here are a few pictures to remind you of the crazy Cornell women. I hope somewhere we just might meet again. Enjoy life, have fun, and best wishes for lots of good adventures." Escape with TerraTrek on one of our premier bicycle tours, kayak and multi-sport vacations in the San Juan Islands... Our Specialty! 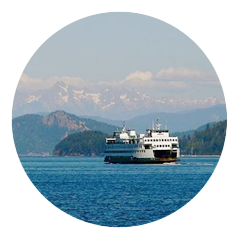 The San Juan Islands offer you an unforgettable multi-sport vacation with spectacular views of the sea, snowcapped mountain ranges and quiet two lane country roads for cycling. Pedal through evergreen forests, past sweet smelling lavender farms and vineyards, cycle along rugged coastlines and through small island villages. We'll take you hiking through old growth forests that wrap around lakes, and sea kayaking along one of the world's best coastlines for viewing orca whales in the wild, bald eagles, sea lions and seals. If you would like a day to relax instead of sea kayaking, you can choose a wildlife cruise aboard the islands' most comfortable whale watching boat the "Odyssey". Each day we will provide you with fresh local food and fantastic accommodations every night. All photos and videos of orca whales and kayaks on our site were taken while following the Be Whale Wise Guidelines and the San Juan County, Washington State and federal laws. Founded and operated by second generation islanders, we believe a first class vacation is the result of many factors; extensive planning, local experience, safety, expert guides, small personal groups, the finest equipment, extravagant accommodations, eating locally farmed foods and dining at the highest rated restaurants in the islands, while providing fantastic surroundings and a great group of people to be at your assistance. This may seem like a lot, this is TerraTrek. The San Juan archipelago is a world class bicycling destination because of our close proximity to Seattle and Vancouver B.C; our long days of sunshine (only half the annual rain of Seattle), our amazing vistas of sea, islands and mountains; our incredible abundance of wildlife, and our quiet two lane roads for cycling. TerraTrek offers you an experience you may never achieve through traditional travel, indulging all of your senses in the San Juan Islands... Our Specialty!